In many of our villages you will discover art in creators’ fine arts workshops, where they will share their passion with you. Creators, artists and artisans steeped in the traditions of Provence such as making santons (crib figurines) and Moustiers faience, share their emotions with you and offer a wide variety of items of all styles and for all wallets. 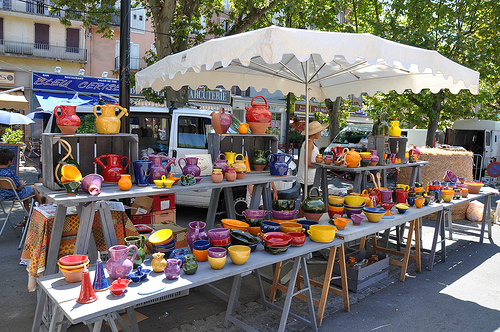 Every year, the Chambre des métiers organises crafts fairs under the name “Artisans sans vitrine” for all fine arts products or by themes (leather, pottery, etc.). These fairs usually take place over one day and their organisation is ensured by a group of professionals who set up an annual calendar of over 70 events from April to October. Activities represented: wool, weaving, textile, silk, hats, leather, jewellery, wood – sculpture, throwing, toys, objects -, ceramics, pottery, stone, crib figurines, dried flowers, metals, etc. Around a hundred “Saveurs des Alpes du Sud” markets are organized every year in the municipalities of the Southern Alps. Passionate craftsmen and farmers offer their craft know-how in the friendly atmosphere of direct sale. The quality of their products is faithful to local traditions.